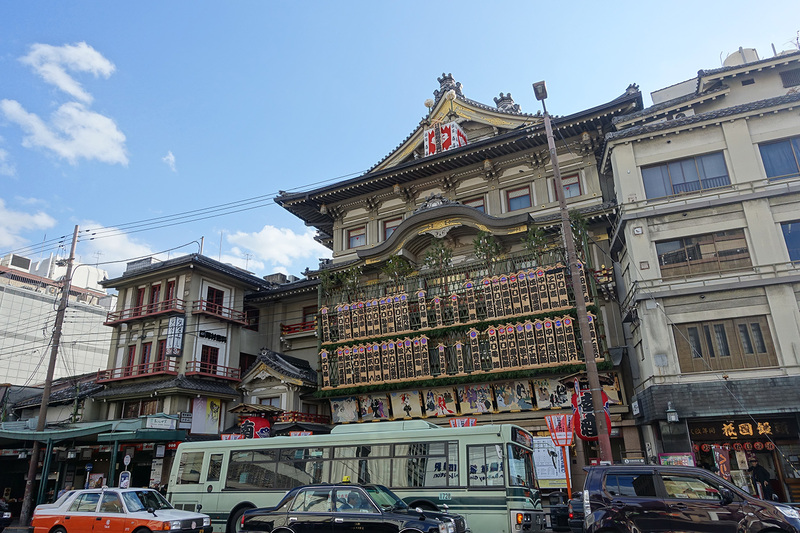 One of the first things we saw when we arrived was the Minamiza Kabuki Theater, where classic kabuki performances can be viewed. 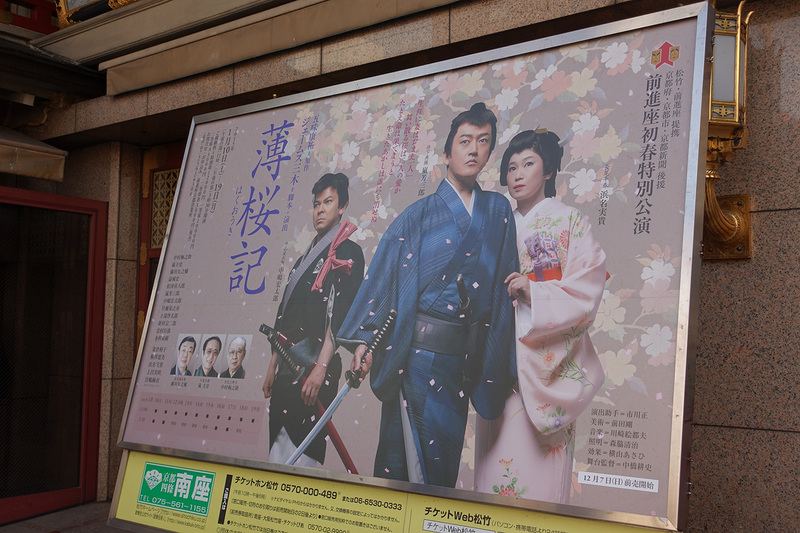 We did not see any performances but we did cross the street to take a look a the playbills. 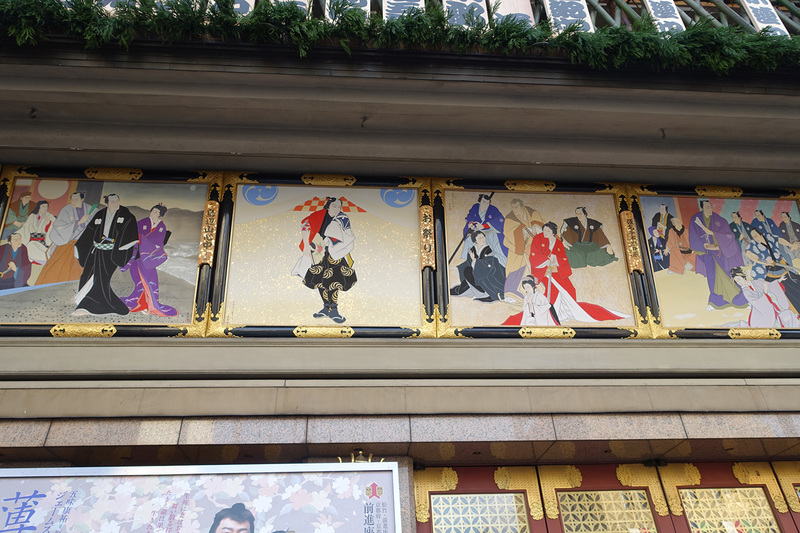 The building was adorned with colorful artwork as well. 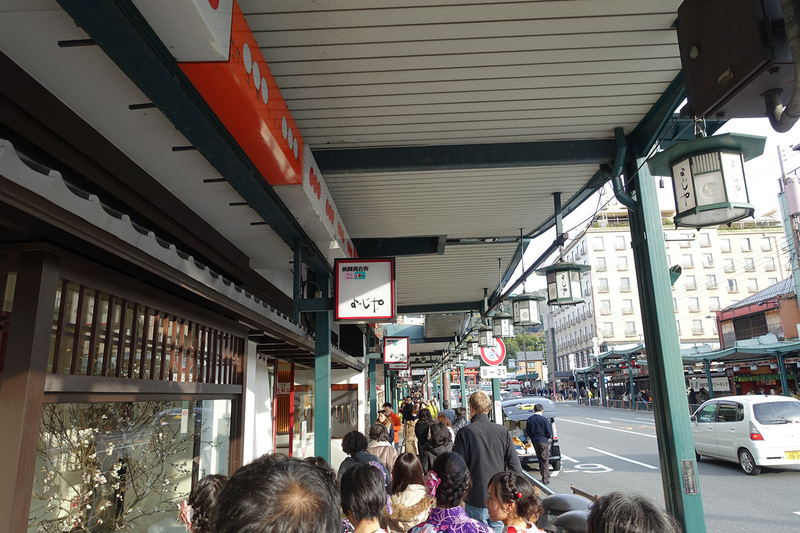 The street is filled with souvenir shops and mochi shops. 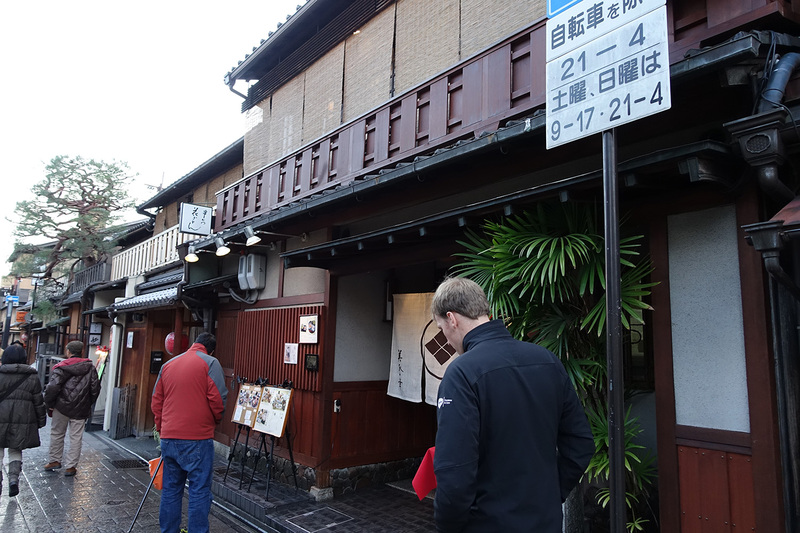 Trust me, the mochi in Kyoto is VERY good. Even one of my traveling companions who does not like mochi actually loved the mochi here. The texture is so fine and delicate so do try it if you visit. 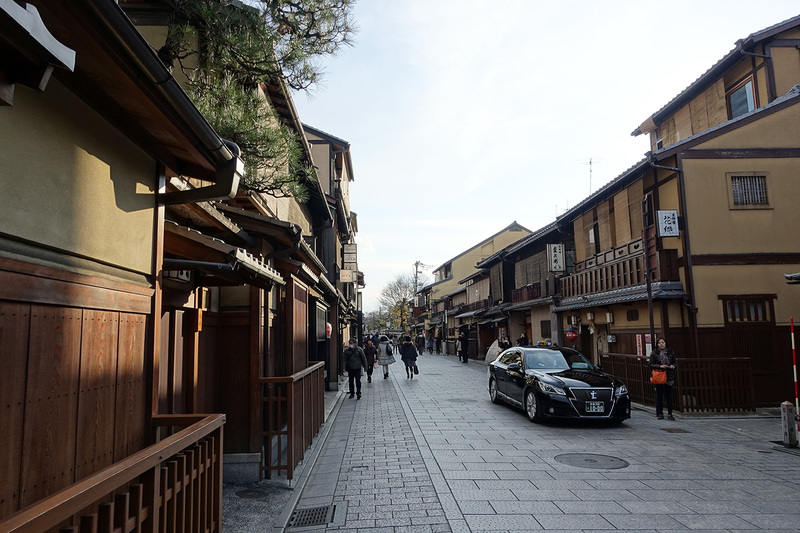 We also headed down a side street, Hanamikoji Dori, lined with many restaurants and shops in historic buildings. It was like stepping back in time for a moment. 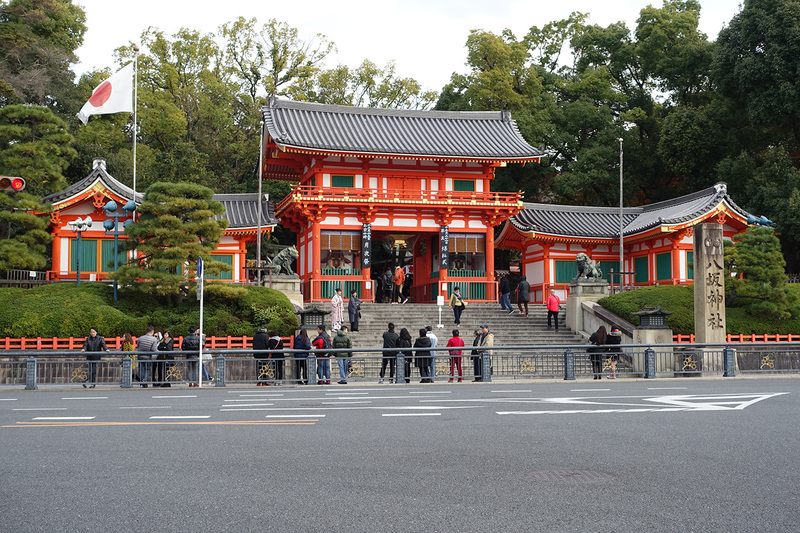 The main street, Shoji Dori, ends at the colorful Yasaka Shrine. We didn’t go in as we were getting numb from the cold and wanted to find a nice place to sit down and have something warm to drink. We had some great luck when we spied a tea room that served a real afternoon tea, complete with sandwiches and sweets. The tea itself was very good. This is my darjeeling. 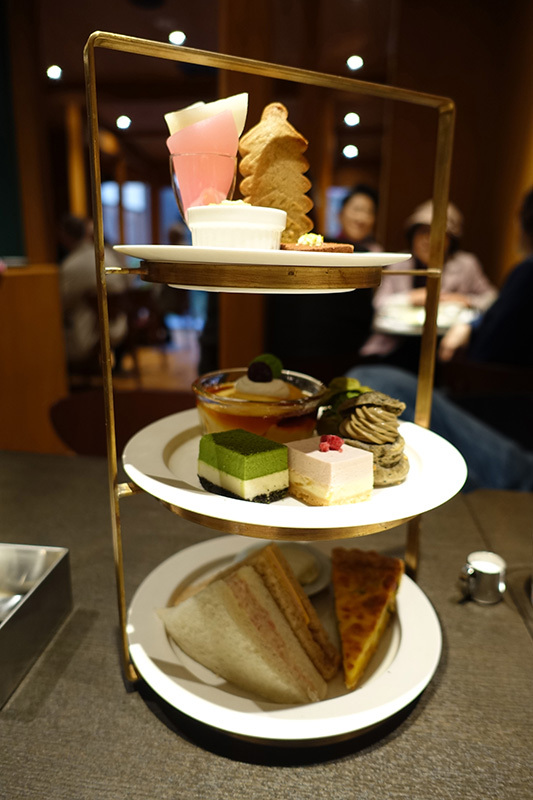 Here is the tea tray we ordered. 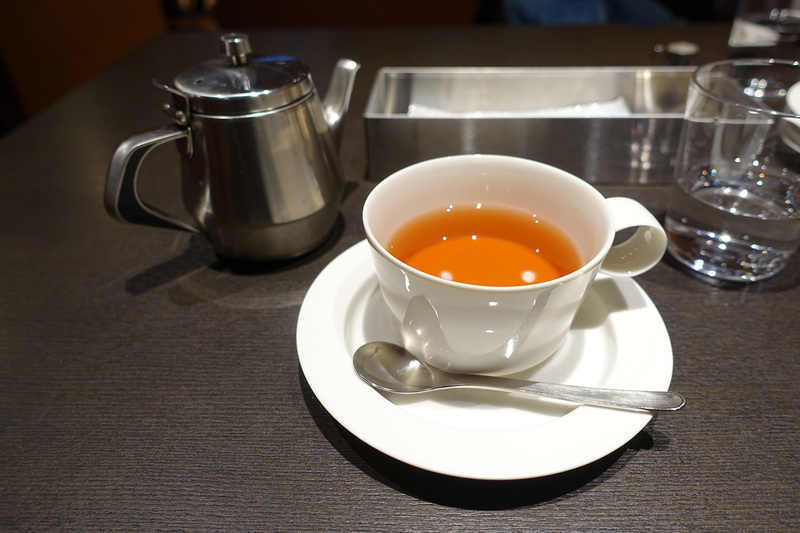 The tea and snacks were enough to warm us up and fortify us as we waited for dinner. 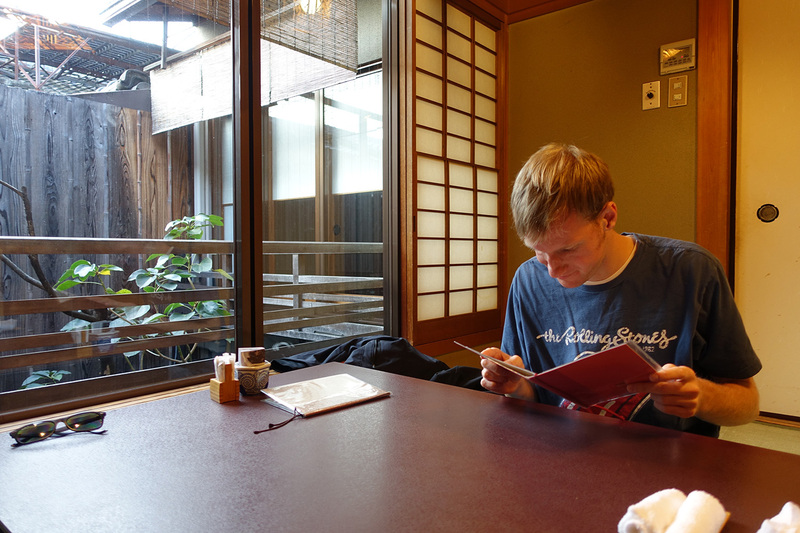 Before we found the tea house, we were fortunate enough to come across a restaurant where we could get a reservation. I’m not sure of what the establishment’s name is but I was able to find it on Google Maps. Google even has an interior view! This is where we sat (table on the right). I don’t sit on the floor often and I had to reposition several times as my legs went to sleep. It was a fun experience regardless, though. 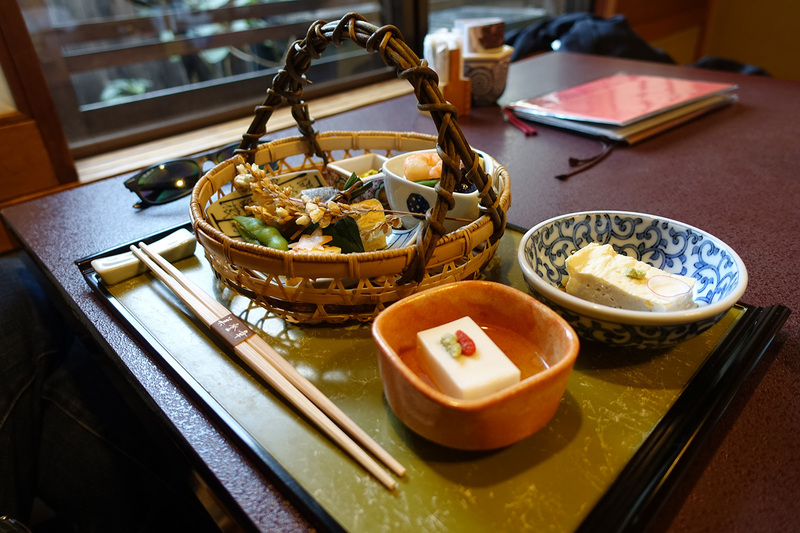 The place serves traditional kaiseki dinners but they require notice to prepare for that. We therefore had an abbreviated version which was quite tasty. I chose the vegetarian dinner and my first course was several different types of tofu. There were couple of other tofu dishes that come out a few minutes later, including a broiled version and a boiled version, for which I was to boil the tofu myself. 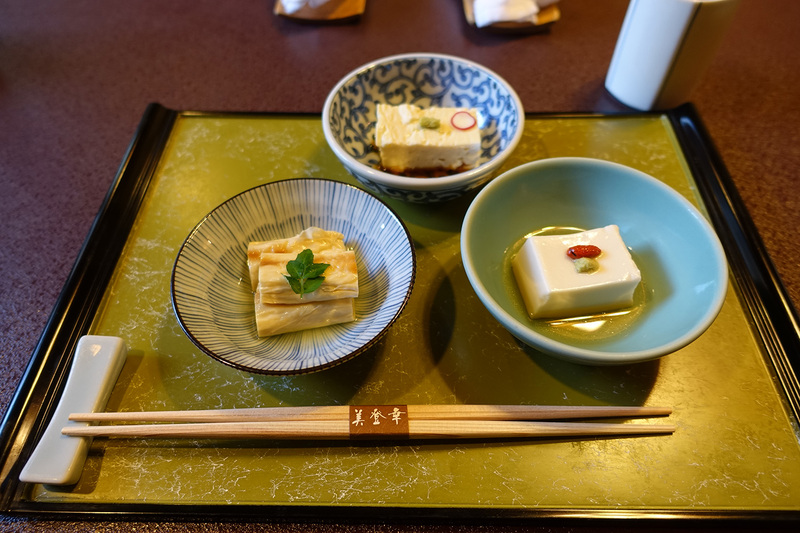 The tofu here was very silky and creamy – much better than the stuff we typically get in the U.S. My next course was tempura veggies. 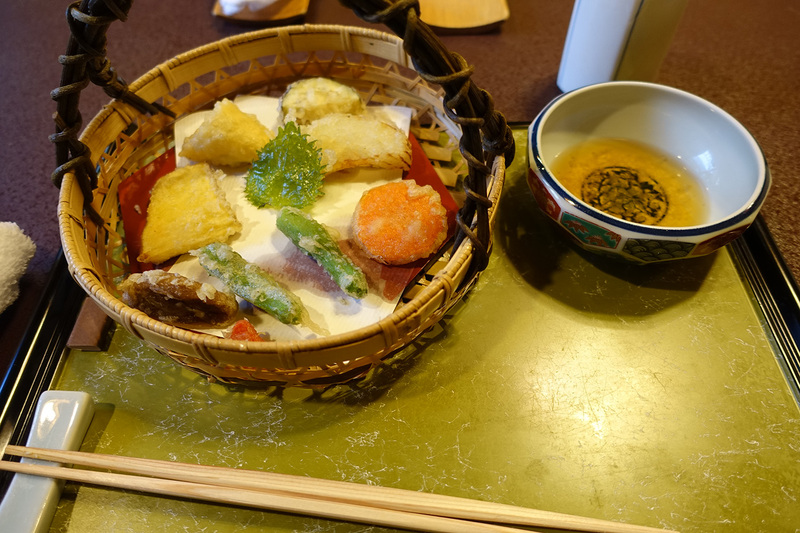 I like how the tempura isn’t like some we have in the states where the food is coated so heavily that it’s like eating a corn dog with a crunchy exterior. 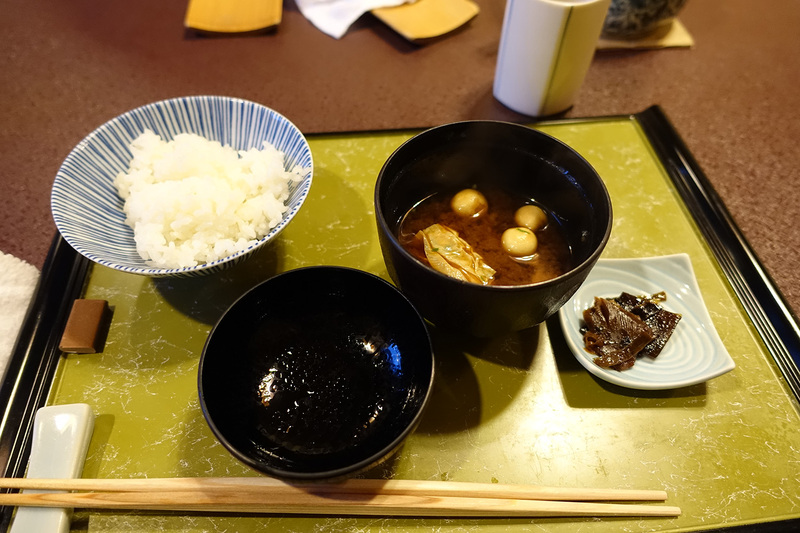 Here is what one of my companions ordered, which included the great tofu. Or next course was miso soup and rice, which was quite good. The rice was excellent – plain rice was actually really good! 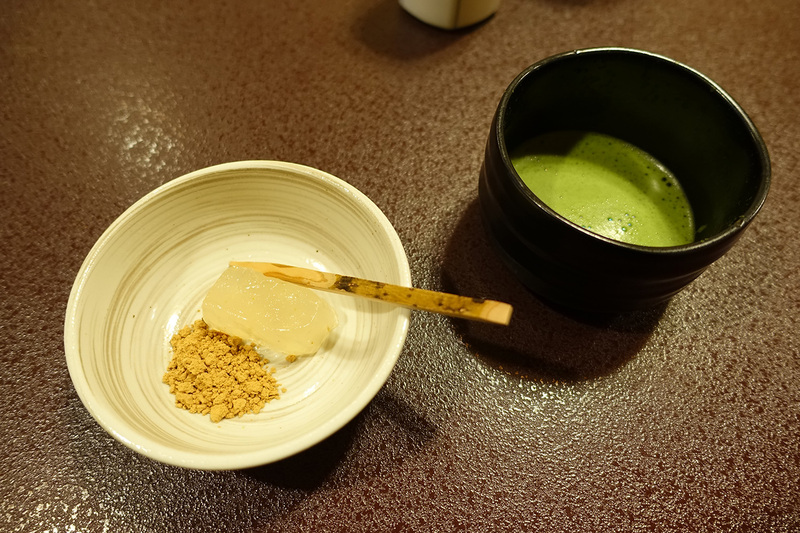 Our final course was dessert, including matcha tea and a clear mochi (warabimochi, perhaps?) served with kinako, a roasted soybean powder. 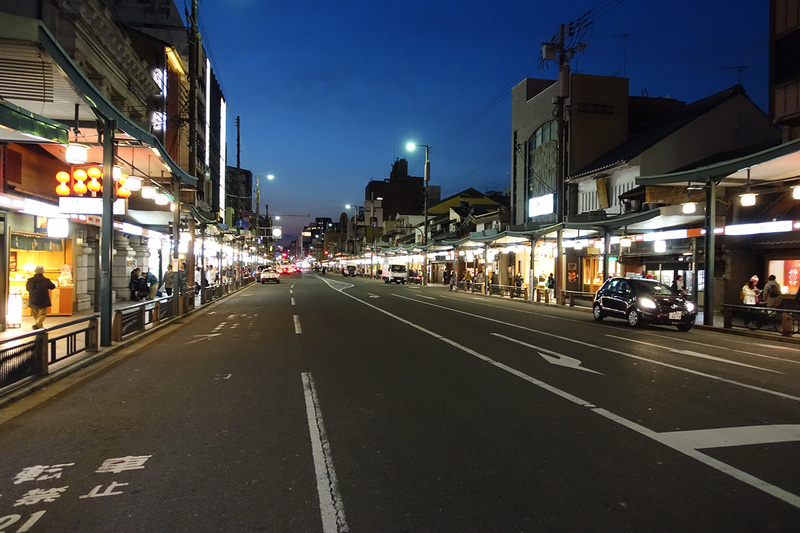 With our tummies full and our legs needing a stretch, we waled back down Shijo Dori to find a cab home. 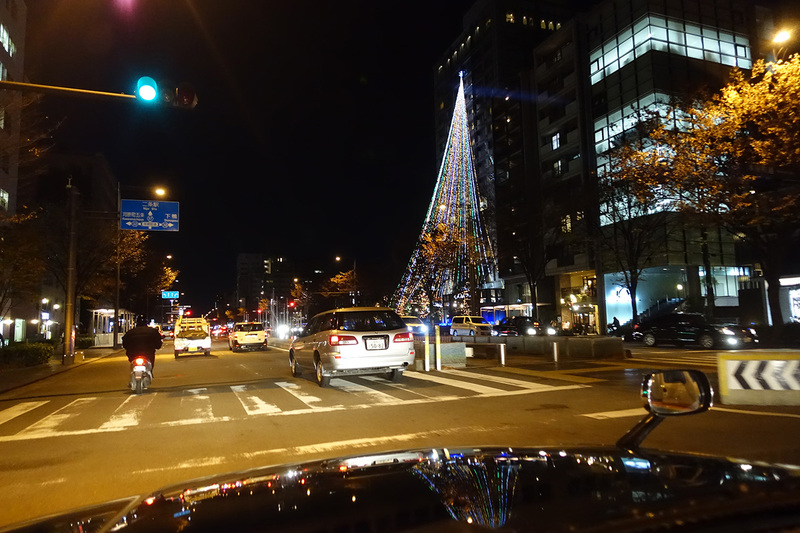 We were fortunate to find a cabbie who spoke English and was able to get us home in no time. The view of the city lit up was beautiful and seeing some Christmas displays helped us remember that the holiday was just around the corner. It hadn’t really felt like Christmas time to us but Day 9 was about to change that. I’ll leave that for the next post.